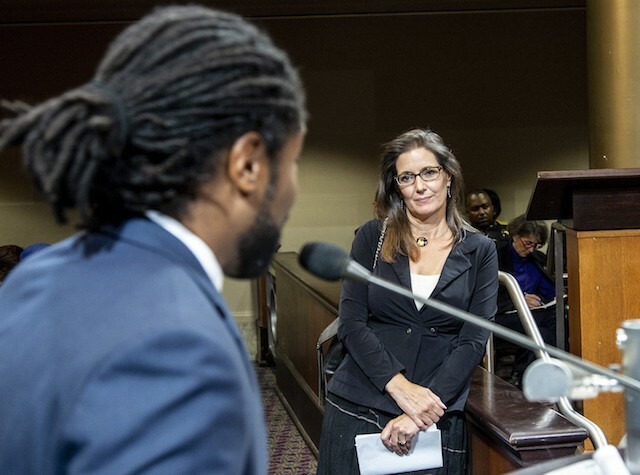 Oakland Mayor Libby Schaaf listens to Henry Gage during a police commission meeting last night. Nine months after the Oakland Police Commission held its first meeting, members of the oversight body continue to complain that they’re not being given adequate resources to do their job. Members of the public who have closely followed the commission’s work since it first met in December 2017 also remain critical of the city administration's slow pace to hire staff and provide training and other assistance. Last night, several police commissioners told Oakland Mayor Libby Schaaf that they feel undermined by the city. Harris continued, complaining to the mayor that the commission still doesn’t have a staff, and that disagreements over legal representation for the commission have bogged down its work on all fronts. Schaaf replied that she’s sorry the commissioners have had a “frustrating experience” and that she hopes to bolster their work. She also said the slow pace affects all of the city, not just the commission. “I need you to stop just talking and do more, please,” Gage said to Schaaf. Rashidah Grinage, an activist with the Coalition for Police Accountability who helped create the police commission, further criticized the city administration and Schaaf, saying that the city has done “nothing to let folks in this community know there is a police commission.” Grinage said the city administrator should conduct an outreach campaign so that the public can become more involved. The police commission was created by voters in 2016. It has the power to review and create policy for the police department. The Community Police Review Agency, which is overseen by the commission, investigates civilian complaints of officer misconduct, as well as instances of police use of force, in-custody deaths, racial profiling, and officer misconducted related to first amendment protected activities such as public assemblies. The complaints by some of the police commissioners that they’re being stymied by the city administrator aren’t new. Since their first meeting, the commissioners have clashed with administration staff and representatives of the Oakland Police Department. Most recently, OPD’s head of planning and research, Tim Birch, told the commission that they don’t have full authority over certain policies and that the department can decline the commission’s policy direction. Earlier this year, the commission also requested that the new inspector general position (a commission staff member who will audit OPD and report to the commissioners) be fully under their control and that this include the sole ability of the commissioners to hire, evaluate, and fire this person. Oakland City Administrator Sabrina Landreth objected to this proposal because, according to Oakland’s city charter, all city staff are under her direct supervision, unless specifically stated in the charter. The city council ignored Landreth’s protest and voted to approved an ordinance allowing the commission to directly supervise their OIG.